MacKillop College’s Student Representative Council (SRC) is very active and makes many positive contributions to the College. The Student Council is represented by students from every year level and meets regularly to discuss and act upon student issues. All students can exercise leadership by taking part in co-curricular sporting,creative and cultural activities. The College realises the importance of students experiencing positions of responsibility and leadership as the associated challenges assist in developing personal skills, values and goals. MacKillop College offers students leadership training and in-servicing. 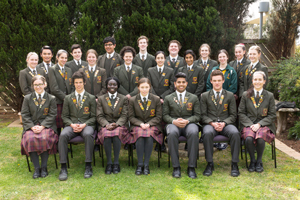 What is the Student Representative Council at MacKillop College? Encourages involvement in environmental groups, clean-up days, tree planting, etc. Who is an SRC Member? Any student from years 7-11 may apply to be an SRC member. There is an application available on the Intranet that can be filled in and emailed to the SRC coordinator. Students will be selected for SRC based on recommendations from their year level coordinators and on an interview, where the role and the aims of the SRC will be discussed. SRC meetings will be conducted in a formal manner with an agenda, minutes taken and a chairperson. Meetings will be held fortnightly or as necessary. These are always at lunchtime and finish in time for students to go to classes.